After record high winter temperatures reduced parts of the course to a bone-jarring, sled-wrecking obstacle course, is the great mushing race on its way out? It’s been 43 years since a kennel owner named Joe Redington seized on the idea of reviving the winter sport of dog sledding by paying homage to one of the most heroic tales from Alaska’s pre-statehood days – an epic journey by dog sled that brought a life-saving serum to the remote town of Nome, where children were dying from a diptheria epidemic. The running of the Iditarod has turned dog sledding into Alaska’s most popular winter sport. 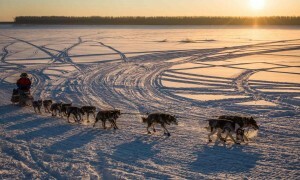 But after this winter’s record high temperatures – and a decade of perilously declining sea ice and permafrost across the Arctic, the question is now unavoidable: has the great dog sledding race had its day?